DETROIT – The Detroit automakers are largely forgoing the traditional two-week summer break at their factories and speeding up production to meet buyers’ growing demand for new cars and trucks. Ford said Wednesday 21 of its North American factories will shut for only one week this summer. That includes the Chicago plant that makes the Ford Explorer SUV and the Mexican plant that makes the Fusion sedan. General Motors will idle its factories only for short periods, while Chrysler plans a two-week break at just four of its 10 North American assembly plants. Both GM and Chrysler are rolling out critical new models. The three Detroit carmakers traditionally shut factories for 14 days around July 4 to do maintenance and change the machinery for new models. But they don’t have that luxury this year. U.S. demand for new cars and trucks has been strong, up 7 percent through April, led by soaring demand for full-size pickup trucks as home construction rebounds. And after closing more than two dozen factories during the recession, U.S. automakers need to use their remaining capacity to its fullest. Earlier this week, General Motors Co.’s North America President Mark Reuss said GM might pause work to change over some machinery but won’t have full shutdowns. A small number of plants could close for up to a week. The nation’s biggest automaker is in the midst of releasing 20 new models, including the new Chevrolet Silverado and GMC Sierra pickups. Chrysler has canceled downtime at three assembly plants, including the two Detroit facilities where the SRT Viper and Jeep Grand Cherokee are made and the Toledo, Ohio, factory that makes the Jeep Cherokee. Ford said it will produce 40,000 vehicles during the week it’s staying open. In all, the company plans to produce 240,000 more vehicles this year than it did last year in North America. It will soon add a second shift to its Flat Rock, Mich., plant to make the Fusion sedan and a third shift to the Kansas City, Mo., plant where the F-150 pickup is made. It’s also increasing the speed of its assembly lines, allowing plants that might have made 60 vehicles per hour to make 65. James Tetrault, Ford’s vice president of North American manufacturing, said that a decade ago, Ford had to idle factories because each only made one vehicle. If demand waned for that vehicle, the company needed to cut production. Now, it has flexible plants that make multiple vehicles on the same assembly line. If the Taurus sedan is selling slowly, for example, Ford can quickly switch over and make more Explorer SUVs at the same Chicago plant. “It’s a lot easier to figure out how to make more than to shut down a plant,” he said. Chrysler said in a statement that all but one of its 16 engine, transmission and metal stamping plants will work through the summer. 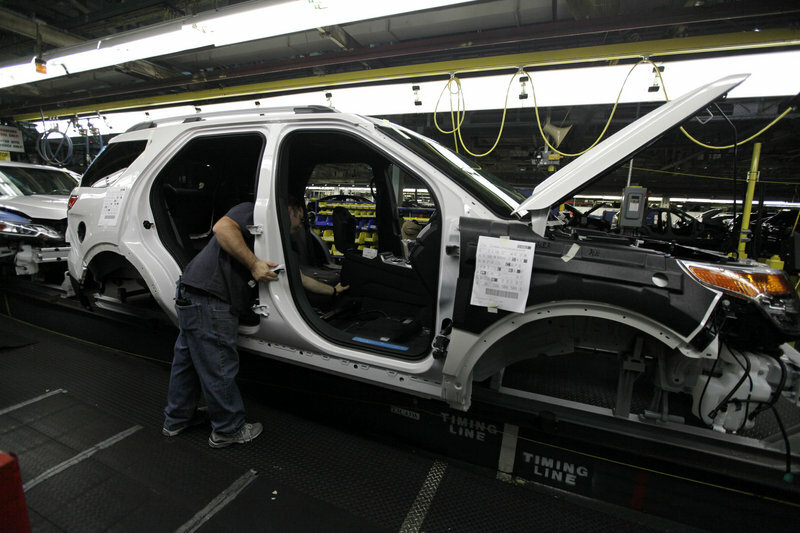 Only four of its plants — Brampton and Windsor assembly plants in Canada, which make large cars and minivans, and two Detroit-area plants that make the Ram pickup and midsize cars — will close for a full two weeks in July. Reuss said GM hasn’t had formal two-week shutdowns since it emerged from bankruptcy protection in 2009. Workers’ pay isn’t impacted by the change, since the shutdowns are paid vacations. Not all automakers are changing their schedule. Honda and Nissan said Tuesday they still plan to close their U.S. plants for a week around July 4. Toyota is also planning to shut down its U.S. plants for a week this summer.